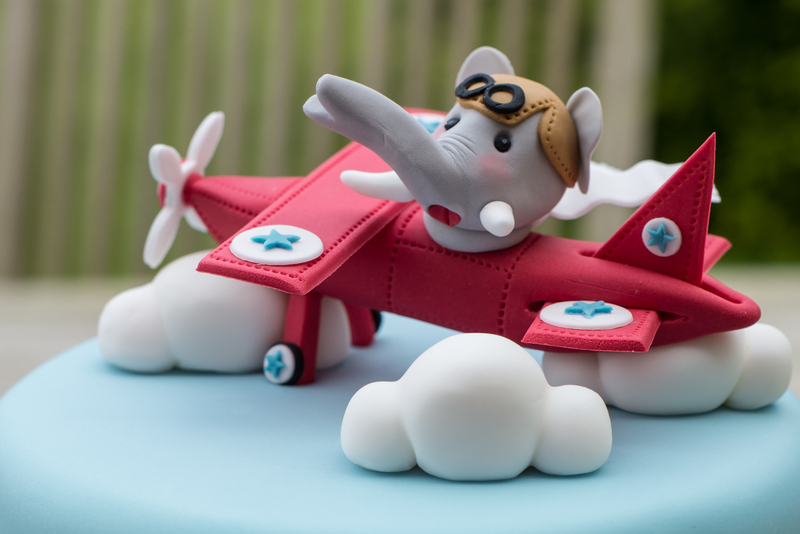 I hope you find my fondant airplane tutorial complete with elephant pilot helpful! 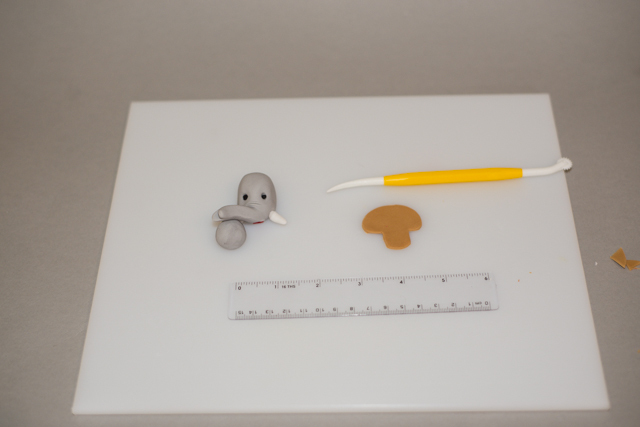 This is my first ever tutorial, so the photographs are a bit rough but I’ve got to start somewhere. I must apologise but inexperience made it difficult to photograph a few things which I’ve had to add into the text. Please read the text for the full instructions & look at the pictures for reference. 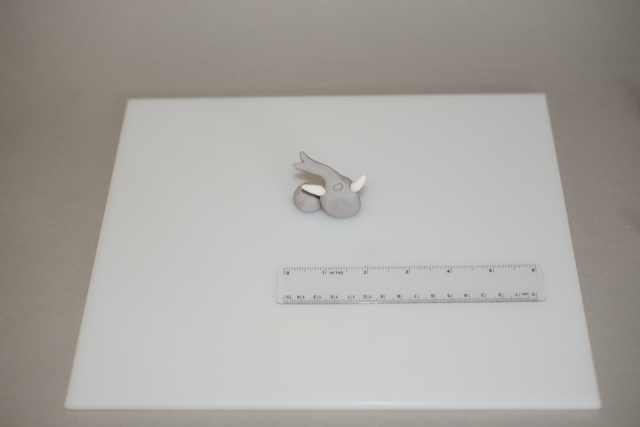 All measurements are approximate and are intended as a guide. 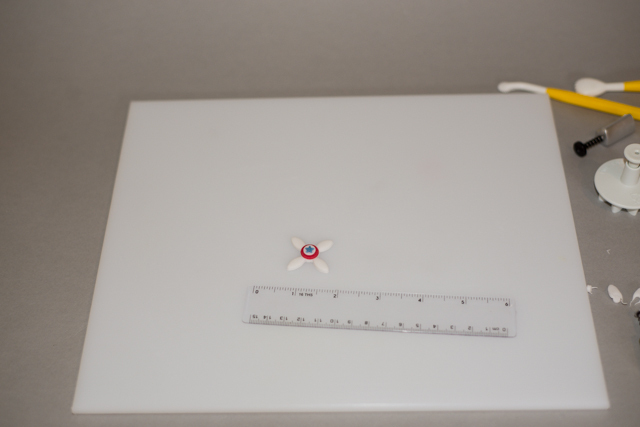 This topper is just the right size to sit on a 6″ cake, however I have previously used him on a 10″ cake. When I refer to Renshaw’s, in this tutorial I mean Renshaw’s Décor-ice Ready to Roll Icing – it’s pre-coloured but any brand would do. 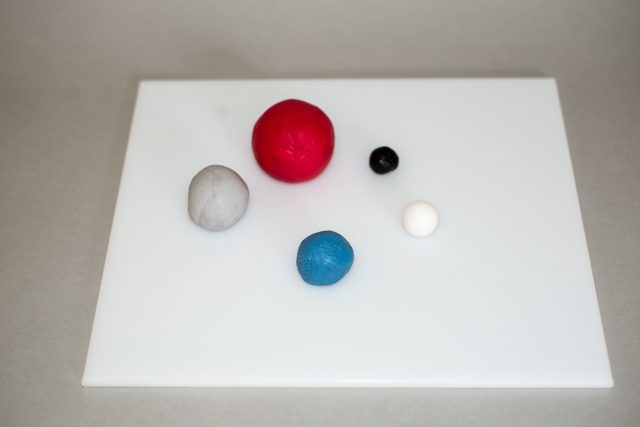 You could also mix your own colours into white fondant by your favourite brand. I was just using up what I had left over from other projects. When using alcohol as glue, please don’t use too much as it, like water, will dissolve the sugar and go gloopy. Sparingly in the way to go – you can always use a bit more if it doesn’t stick the first time. Gin is what we have in the house, so I use Gin. You can use Vodka or edible glue too. I prefer the alcohol because evaporates without leaving a residue if you have to move something around. 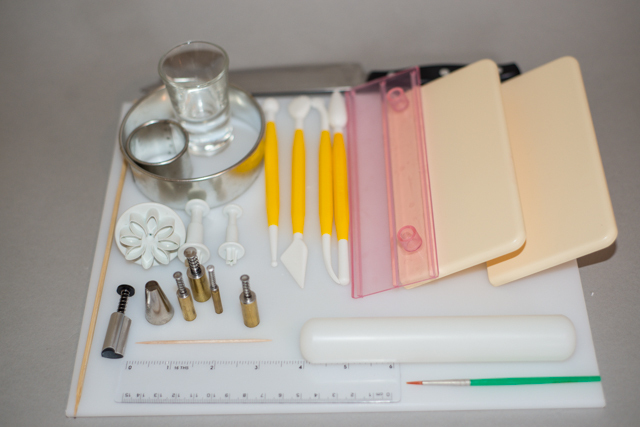 I have been collecting sugar craft tools for some time now so this seems like quite a long list. Instead of using cutters, you could cut templates from card and cut around them with a sharp knife. 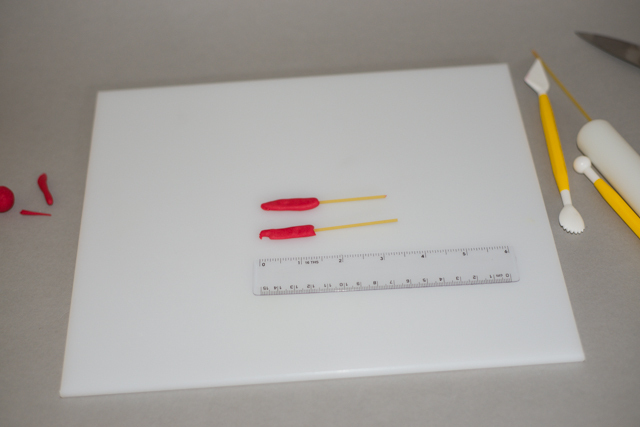 The modelling tools could probably be replaced with a combination of a cocktail stick, a small sharp knife, your fingers and thumbs, but I have spent money on the tools, so I’m going to use them! I also used pale pink petal dust and a couple of drops of white airbrush paint to add a few highlights to the pilot’s face. I used 50% fondant and 50% petal paste because I wanted this to set very hard. You could also add CMC to fondant, but I don’t have much experience of this. To make the colour, I had some Renshaw’s “Poppy Red” fondant, but only white Squire’s Kitchen Petal Paste. When you mix the two, it makes pink, so I boosted the colour back up to red by adding some Sugarflair “Christmas Red” and Bennett’s “Ruby” paste colours. I had to use quite a bit to get the colour right. It became a little sticky, so I used some corn flour to stop it sticking to my fingers. I had Renshaw’s “Black” fondant from a previous project. This wouldn’t be an easy colour to mix from a white base. I used Squires Kitchen white petal paste because I needed the paste to be very thin and dry very hard. I coloured white fondant with Wilton’s “Cornflower Blue” paste colour. When I took the photo for this tutorial, I went overboard on the quantity of the blue. 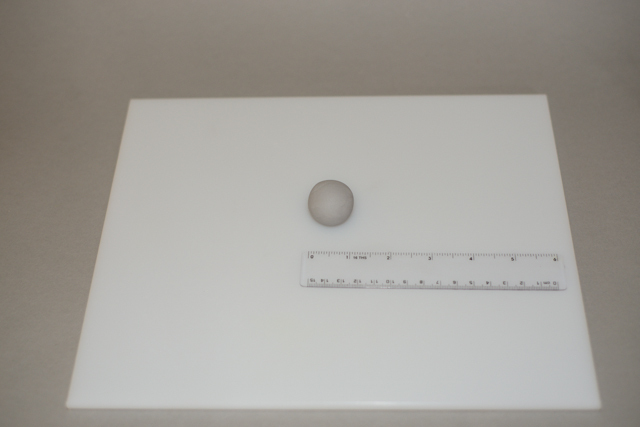 This project only uses a very little so ½” ball will be more than enough. I used 50% Renshaw’s “Grey” fondant and 50% petal paste. At this point, I forgot the pilot was wearing a flight helmet, so please also prepare a little blob of brown. I had some Renshaw’s “Teddy Bear Brown” going spare, so I just used that. 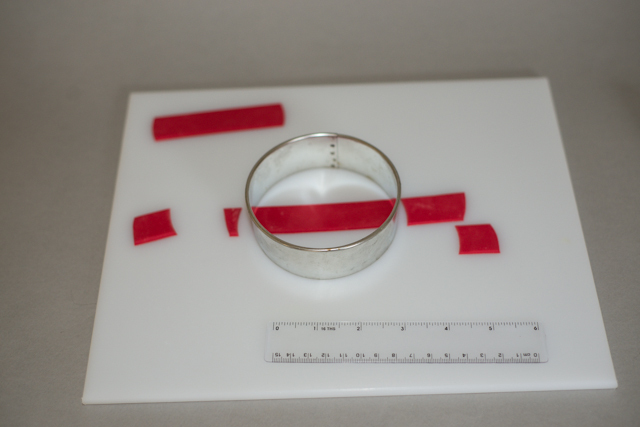 Roll out some red paste 2-3mm (1/16th to 1/8th inch) thick. I have a strip cutter that cuts 7/8” wide strips. I used this, but you could also use a ruler and a sharp knife. Tip: After rolling out to the required size, turn the flattened paste over. 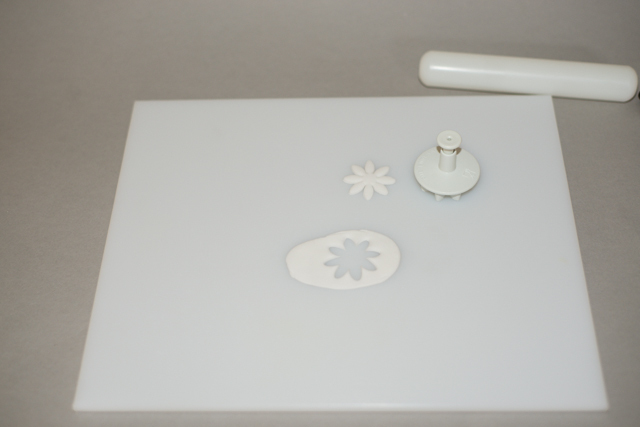 Make sure that the paste is not sticking to the board and it moves around freely. Cut out the shape from the reverse side. This helps to keep the edges smooth. Do not roll the paste after you have turned it over. If it needs to be bigger, smush it up and start again. If the strips stay inside the cutter, rub the cutter edge over the heel of your hand. This will also help keep the edges smooth. 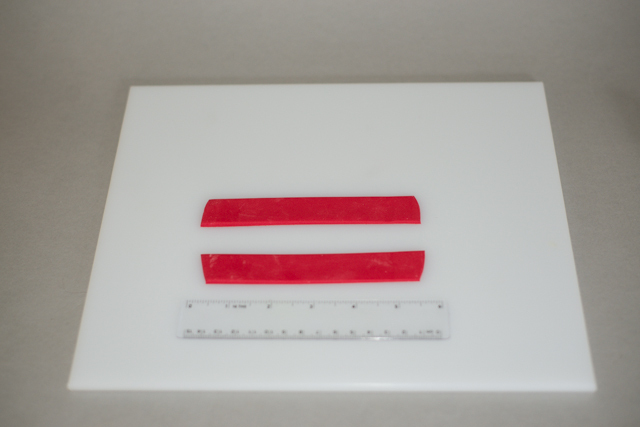 Remove the strips from the cutter – you’ll need two strips about 4-5” long. 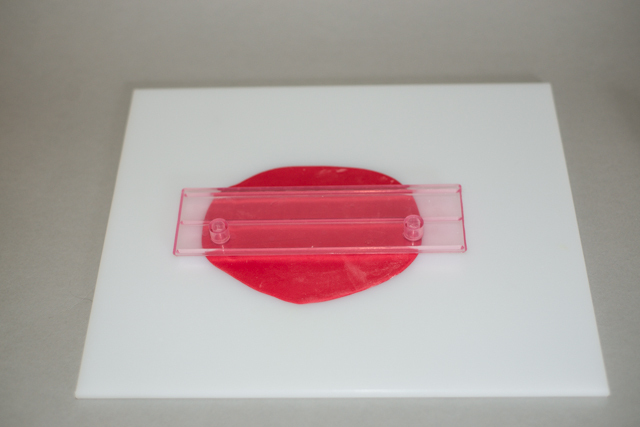 Trim both strips in a round cutter – this one is 3.5” in diameter. You’ll end up with two pieces the same size. You could just cut the ends off with a knife, but I like the slight curve the round cutter creates. To make the horizontal tail fins, cut 1” off either end of 1 strip. 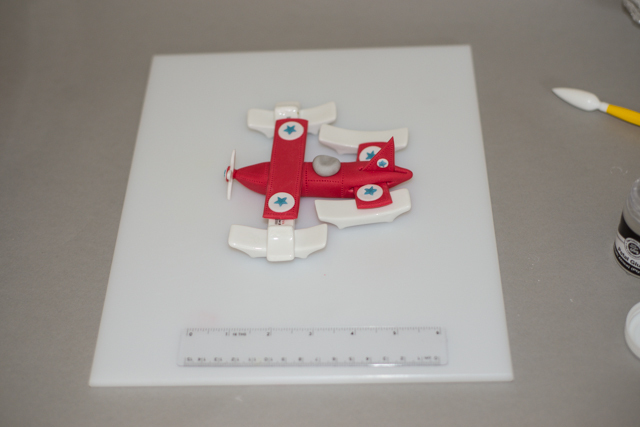 To make the vertical tail fin, cut the middle piece at an angle so the longest side measures 1.25”. Use a stitching tool to make “rivet” marks all around the edge of each panel. Move the pieces only a flat tray lined with baking parchment to dry. 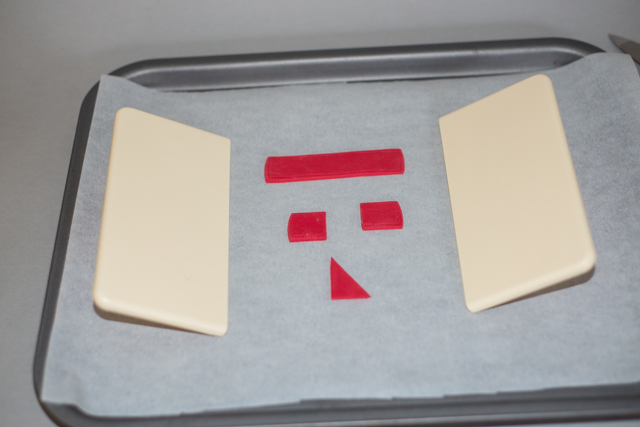 If the shapes move a little when you transfer them, use your fondant smoothers held parallel to each other to reshape & straighten the sides as required. Go gently! 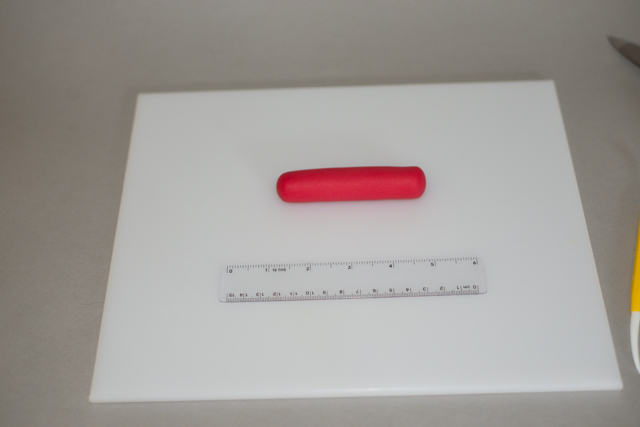 Take a 1.5” ball of red fondant and shape it into a long thick sausage shape, about 3-4” long. 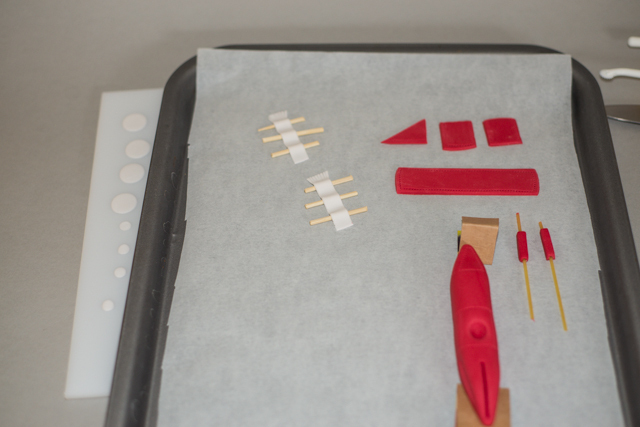 Using your fondant smoothers for straight lines, apply pressure to the sausage at each end to make pointed ends. The top of the sausage should remain flat, while the bottom is angled, with a flat section for the base. The one end should be quite pointy (the front) and the other end should have a more gentle angle (the tail). If the paste is not dry enough to hold its own weight / shape, you can support it on little triangles cut from thick, clean cardboard. 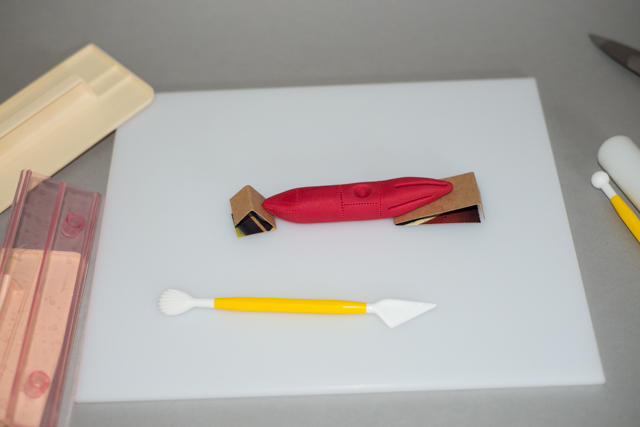 Use the ball tool to make a dent in the body of the plane, which is where the pilot would sit. 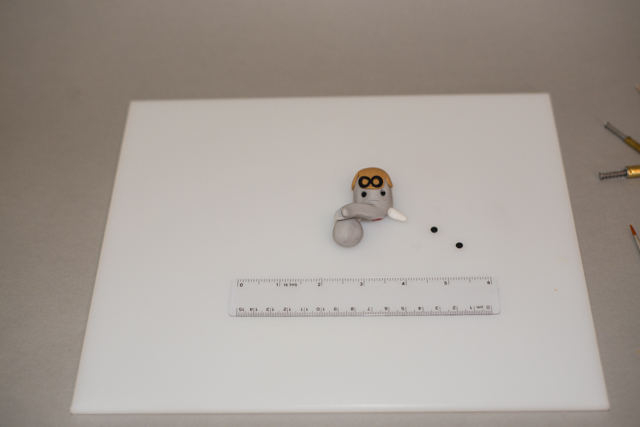 I have used my strip cutter as a guide to measure the distance. 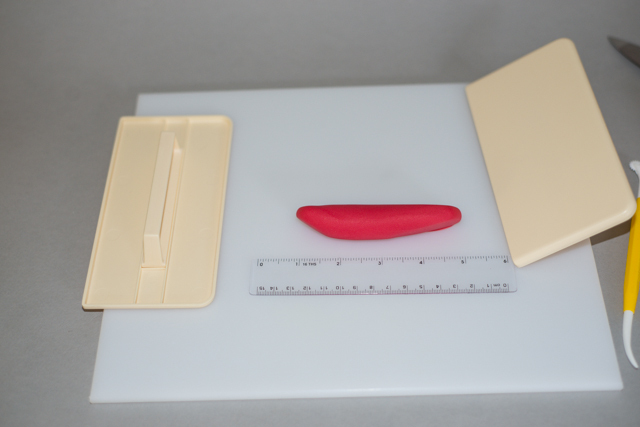 This may push the body out of shape so just keep using your fondant smoothers to apply equal pressure to the sides to straighten them out again. Use the stitching tool to make more “rivet” marks on the body of the plane where each panel would be. Use the blade modelling tool to slice slits at the tail end of the body for each of the tail fins (1 on each side and 1 on the top). As you go along, you will need to stretch these slits so ensure that the tail pieces fit snugly. This is a fine balancing act: not wide enough and the fins won’t go in – too wide, and they might fall out. My advice to myself is go slowly – you can always make it bigger! Break a piece of spaghetti into 2 x 3” pieces. 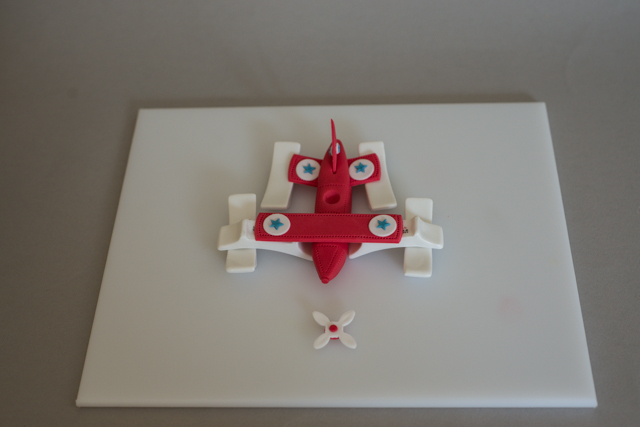 Flip the plane body over, insert the spaghetti pieces into the body where the wheel struts might go. These will be at an angle. Remove. This is just to make a hole to glue the wheel strut in place. Roll 2 small balls of red fondant, each about a ¼” in diameter then roll each ball into a small sausage shape. Carefully push the spaghetti up into the middle of the sausage. Use your fondant smoothers to shape and square off the sides of each sausage. 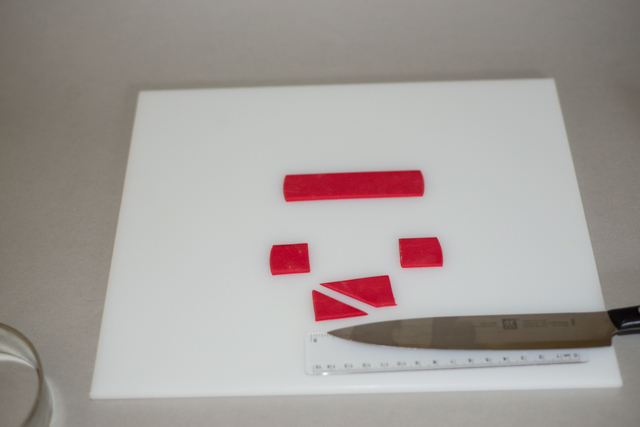 Cut off the uneven ends of the fondant only using a sharp knife, being careful not to cut or break the spaghetti. 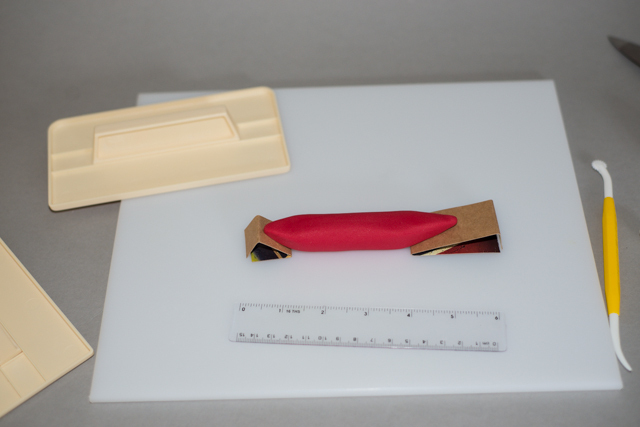 A small section of spaghetti must peek out from one end (This end will go into the plane body). The long ends will go into the cake. Tip: If you are 100% certain that no-one will try to eat the topper as is, you could use cocktail sticks instead of spaghetti. I would only recommend doing this if you are going to be serving the cake yourself – that way you can make sure that the cocktail sticks have been removed from the cake prior to feeding your guests. When you are happy with the shapes, move the body and the wheel struts across to the tray to dry. Once again, if the edges aren’t straight or get dented, just use your smoothers to push it back into shape. If you do this on the tail end, just remember to reopen the tail fin slits with your blade tool. Roll out about half of the white petal paste until really thin, about 1mm or less. 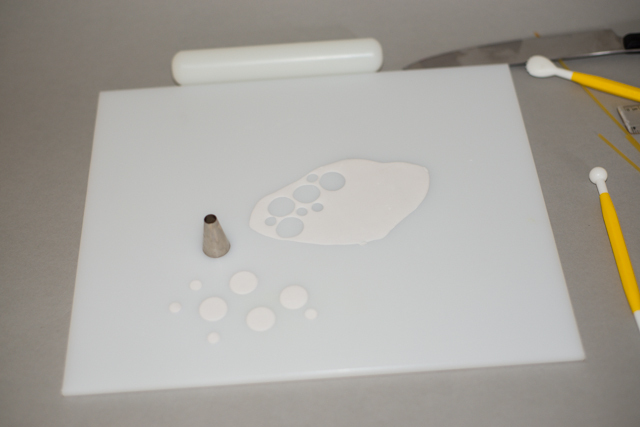 Using a #12 icing nozzle cut out at least 4 x large end and 5 x small end round shapes. I say at least because you might need more. I’m a klutz and will drop a couple of these while I’m putting it all together. Use the strip cutter to cut a 2” long strip. Cut it in half (lengthways) and then fringe one end of each strip. A sharp small knife does the trick. Cut a kebab stick into 6 pieces. Lay the scarf strips on top of these on the drying tray. Press down the areas where there is no stick to make a wave in the piece. When the petal paste dries, the scarf will keep the wavy shape. It will look like it’s blowing in the wind and will give a little bit of movement to the topper. Roll out a small piece of blue fondant, as thinly as you can. You might want to let it sit for a few minutes before you start cutting out some stars. The stars are teeny tiny, and if the fondant is hot and soft, they can be very fiddly. 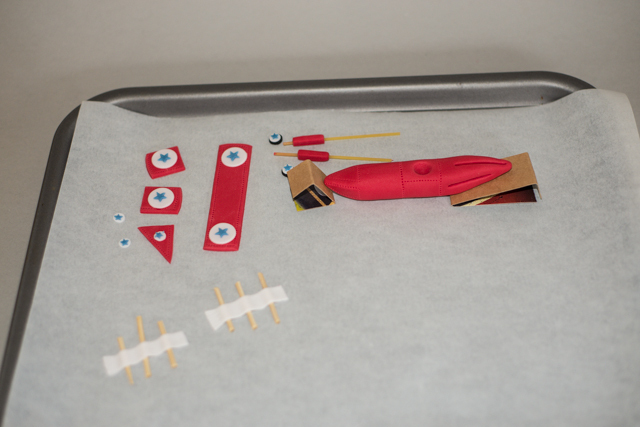 You can roll out the blue & then move the scarf pieces – the time it takes you to lay the scarf pieces over the sticks will give the blue some time to settle. 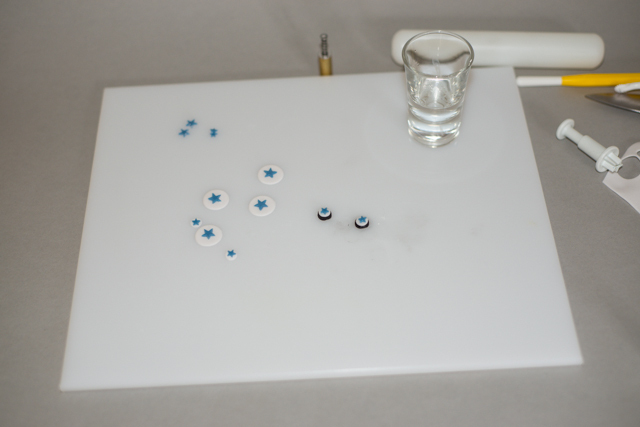 Cut a blue star of the appropriate size for each white disc that you have cut. Roll out a small piece of black fondant. This can be quite thick (3-4mm) as these are the tyres. I used my circle cutter that is just slightly bigger than the #12 tip. Use alcohol on a small paintbrush to stick the decals together. Stick an appropriate sized star on each white disk. Put one of the smallest white disks onto each of the black wheels. 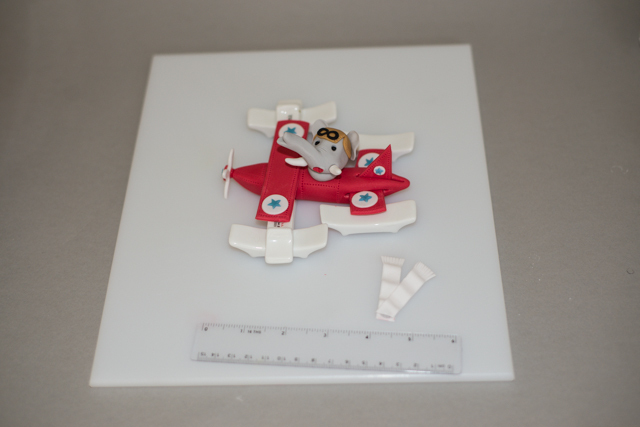 To make the propeller, smush up the white petal paste and re-roll it so that it is 3-4mm thick. Using a pointed daisy cutter about 1.5” in diameter, cut out the flower shape but remove every second petal with a sharp knife. Cut out a circle just slightly bigger than the middle of the flower/propeller and attach it using alcohol. 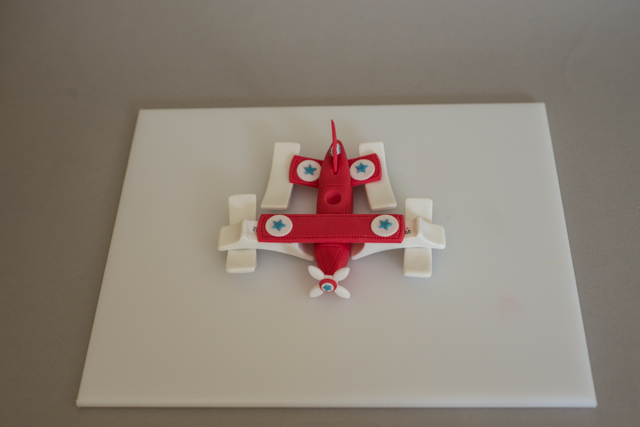 Try to keep the back of the propeller neat because it will be seen if you view the topper from the side. Also cut out a red circle the same size, and attach it, along with the pre-made smaller white disk and star. Set aside on the tray to dry. Start off with a ball of grey about 1” in diameter. Pinch, squeeze, smooth and roll the trunk shape out of one end. This may take a bit of practice. If it doesn’t look right, just squish it together and start again. Don’t do this too often though; modelled parts don’t look 100% right until the very end anyway. 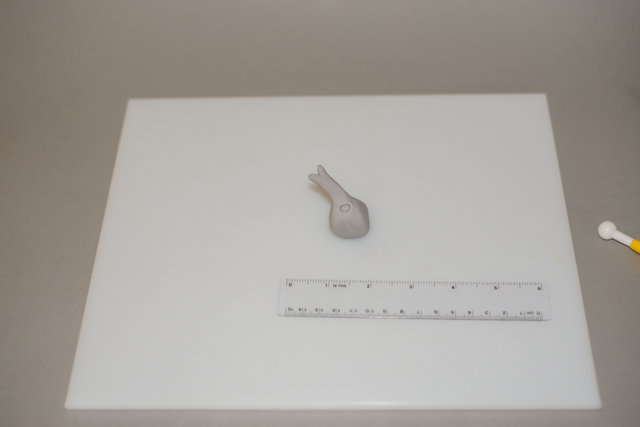 Use your thumbs to mould and shape large eye sockets on either side of the trunk. Using the blade tool or sharp knife, cut a slit in the end of the trunk and smooth the ends. Create some wrinkles on the bridge of his nose by lightly cutting into the paste. Using the small ball tool, make dents for the eyes. 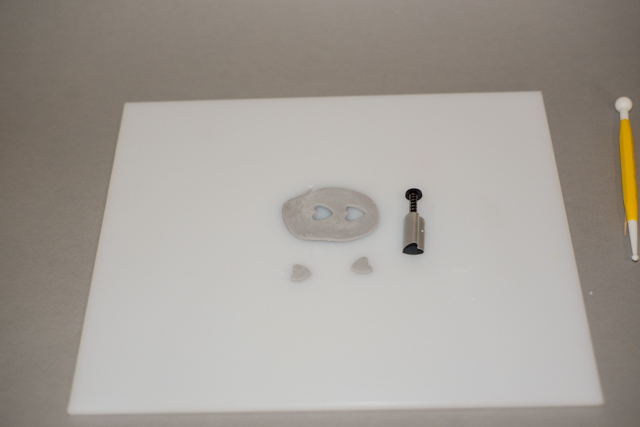 Also using the small ball tool, hollow out an oval shape under the trunk for a mouth. 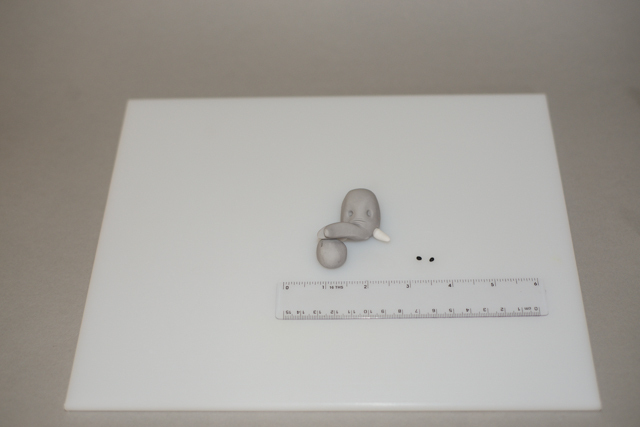 Roll a small ball of grey to use a support for the trunk while you work and it dries. Twist the trunk so that it rests on the ball, but doesn’t stick to it. You can dust the ball with a bit of corn flour if necessary. Make two small holes on either side of the trunk for the tusks. I used a cocktail stick to make the hole. Divide a tiny ball of white petal paste into two. Roll into a rough sausage shape and mould both ends into a rounded point. 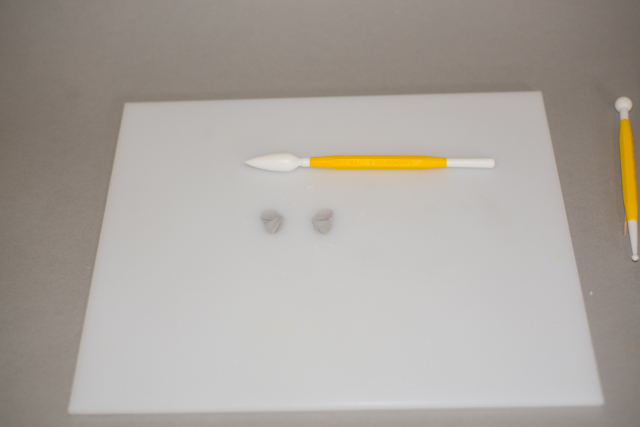 Paint a little alcohol into the tusk hole (you can use the paintbrush to make the hole slightly bigger if need be). Insert a pointy end of the tusk into the hole and gently squeeze to secure it in place. Repeat for the other side. Pinch off two teeny tiny bits of black fondant and roll into little balls. These are about 1-2mm in size. 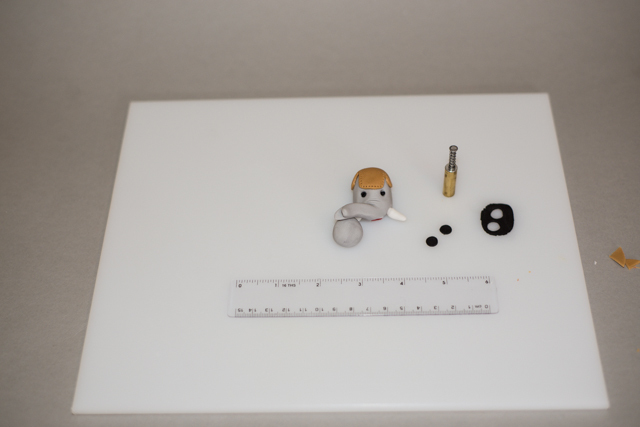 Dot a little alcohol into the eye socket and place the little eyeball into the socket. 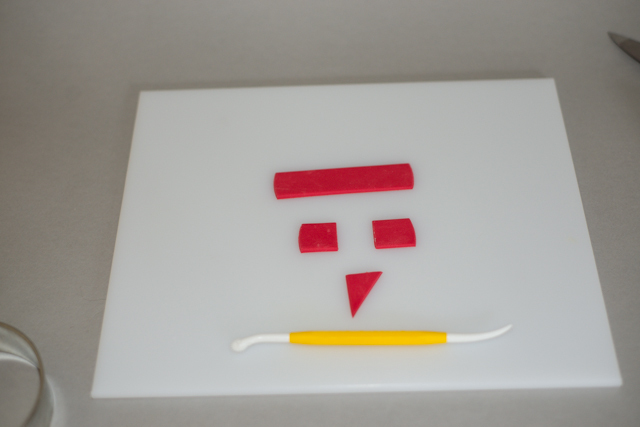 Pinch off a tiny bit of red fondant for the mouth. Roll into a sausage shape. Paint the mouth with a little alcohol and press in the red sausage. You can use the pointy end of a cocktail stick to mark a groove in the tongue. To make the hat, roll out a small amount of brown fondant, and cut out a circle which will more or less cover the back of his head. I used a 1.5” cutter. 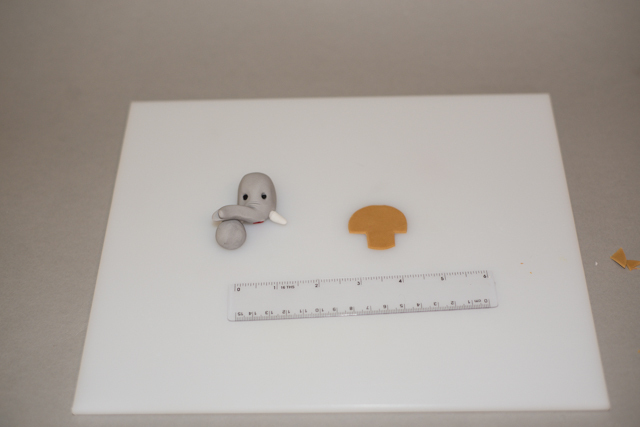 Cut away two sections so that the remaining shape looks like a “T” or a mushroom. You can use a flower or leaf modelling tool to round out the edges. Paint the reverse of the hat shape with a little bit of alcohol and stick to the head and then use the stitching tool to edge the shape. 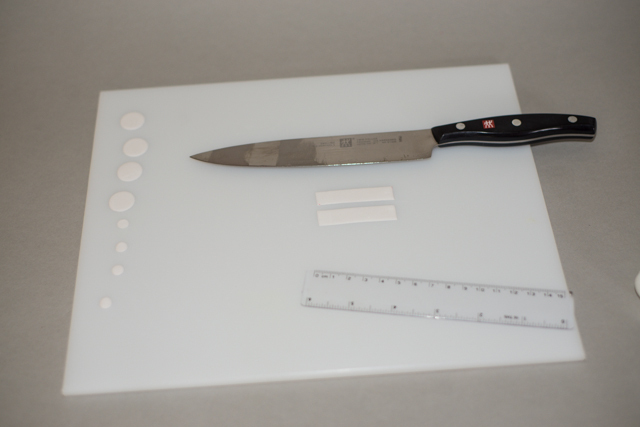 Cut two small circles from black fondant, removing the centre of each circle with a smaller cutter. Using alcohol, stick these side by side on the front of the hat to make a pair of goggles. 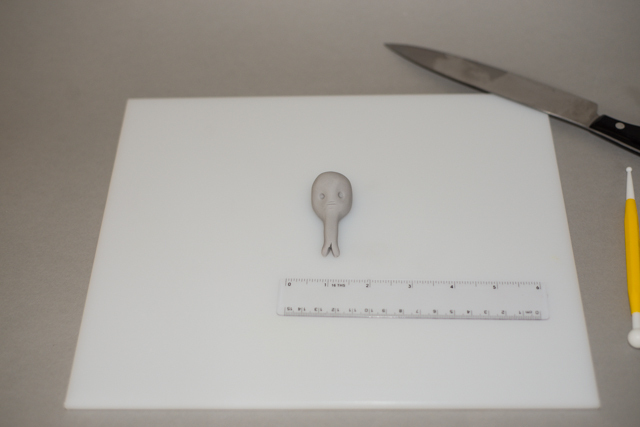 Roll out a small amount of grey paste until it is 2-3mm thick & cut out two small hearts. 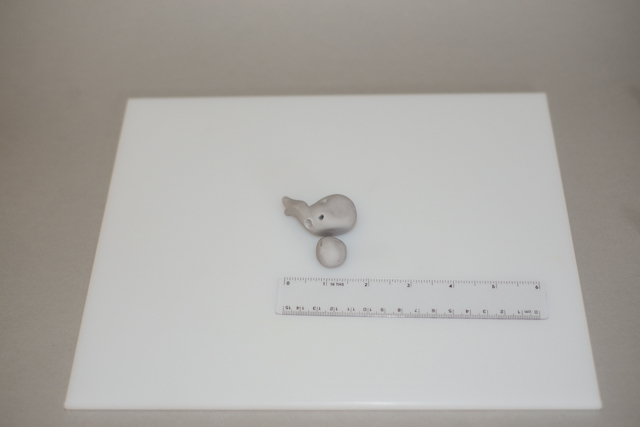 Squash each ear from the middle towards the outer edge – I used the bulbous cone modelling tool to do the job. 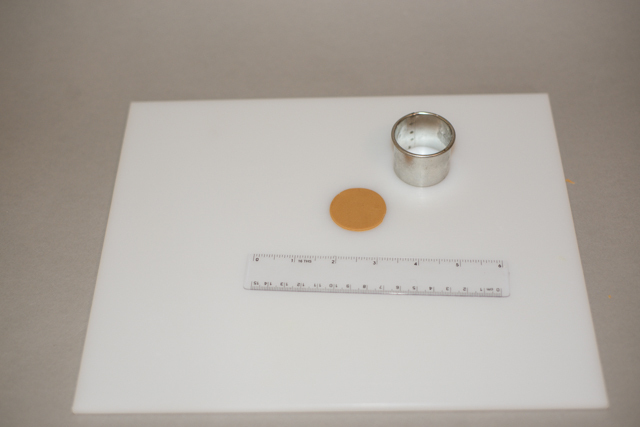 Attach to the back of the head using alcohol. Put all the pieces on the tray to dry for at least 24 hours. Check the tail fin slits from time to time and use the blade tool to widen the slits from time to time as it dries, if necessary. To do the assembly, I use glue because it seems to set stronger than alcohol alone. You can make glue yourself from a little smushed up fondant mixed with water, or you could also use royal icing. First check that your plane parts are actually dry. If not, wait until they are because if you glue them together and they are still a bit wet, they will droop, which causes cracks resulting in breaks and that is not a good look! Also check that all of the slits in the tail are wide enough for the corresponding fins. I do this dry – if they aren’t, I gently use the blade tool to widen them again. 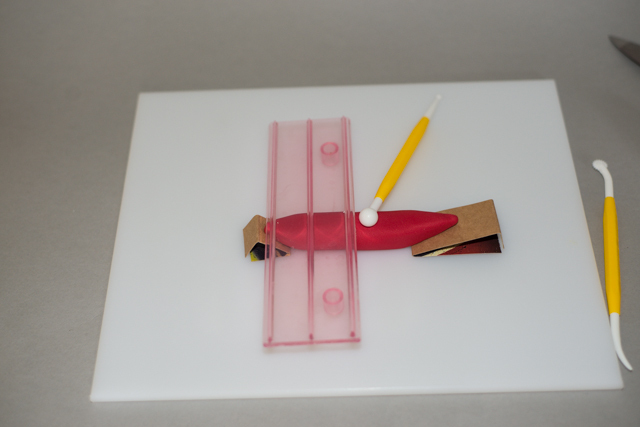 Paint some glue into the slits which will hold the horizontal tail fins. 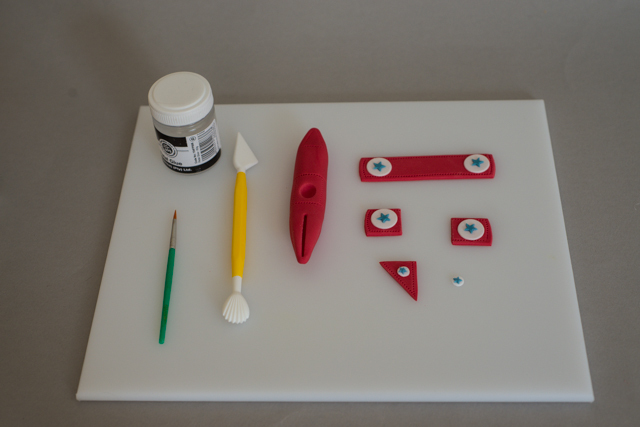 You don’t want to use too much glue because it can dissolve the sugar in the paste which will cause the fins to droop. You don’t want this. 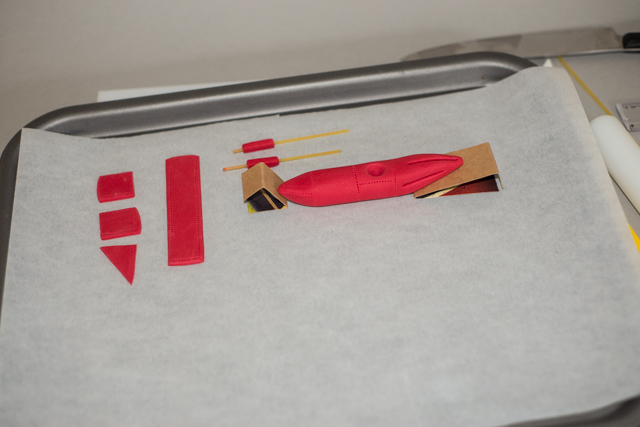 Insert the dry tail fins and rest the fins on something that will support them as they dry. 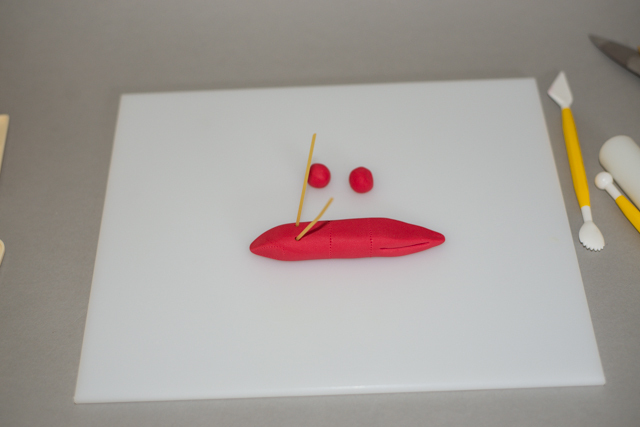 I discovered that the ceramic chopstick rests I have work brilliantly for this. They are curved so generally a point of the curve is at the right height – it’s just a matter of finding the right spot. Attach the tail fin in the same way – put some glue into the slit and insert the dry fin. 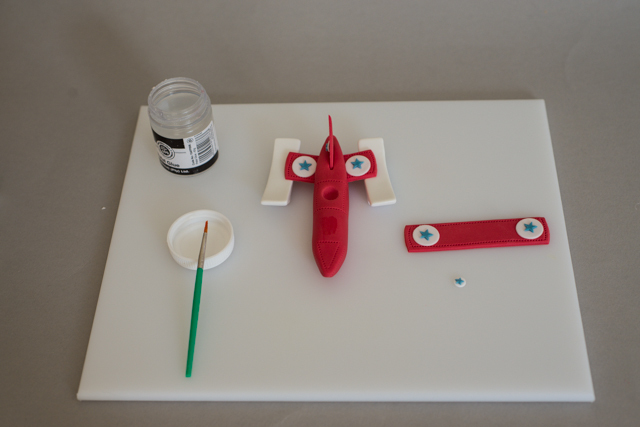 At this point, remember to attach the decal to the other side of the tail fin. 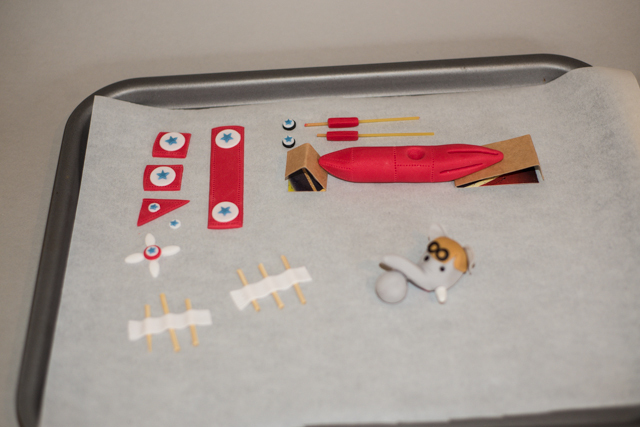 To attach the propeller, cut two small circles from red fondant, freshly rolled so it is still soft. 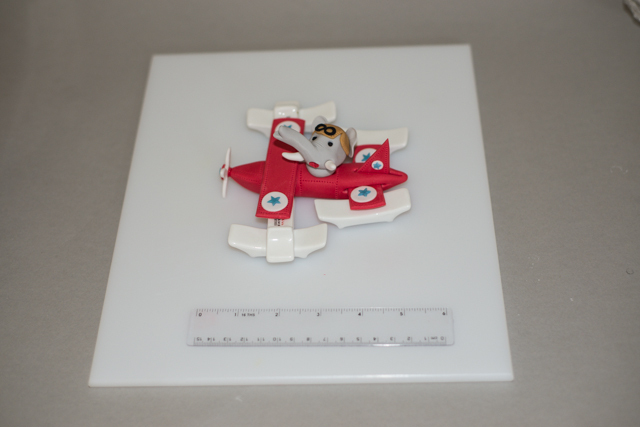 I glue one to the nose of the plane, and one to the back of the propeller. I put a tiny dot of glue onto the circle on the nose and VERY GENTLY squish the two red circles together to glue into place. Roll a ½” ball of grey paste. 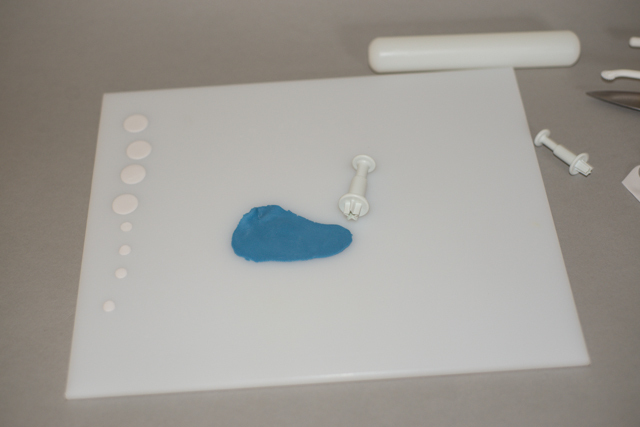 Lightly paint the seat indentation with glue and place the ball into the seat. Using a modelling tool or your thumb, make an indentation in the top of the ball – the head will sit on this. If you angle this dent down towards the back of the ball, the head will look up. If you don’t angle it, the head will look straight ahead and if you angle it down towards the front, he will look down. Think about what height of cake this is going on and decide if you want it looking up, down or ahead. 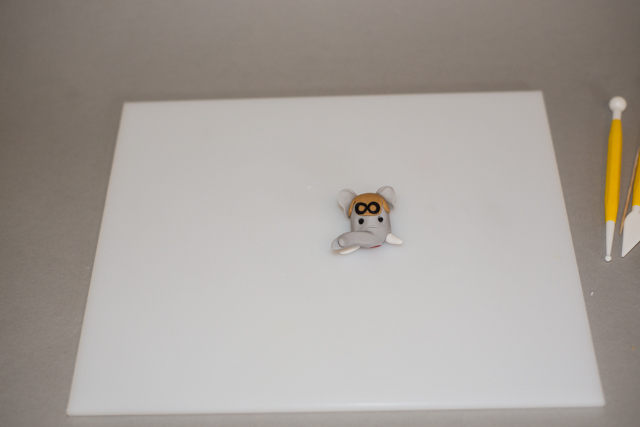 For a single tier, I think it looks better if the little face is looking up at you. Paint the dent with a little glue and attach the head. Assemble the scarf pieces by gluing a tiny flattened ball of paste between the two pieces – as the pieces aren’t flat, they might break them if you just try to glue them to each other. The grey ball of paste that the head is sitting on will not yet be dry so you can attach the scarf under this at the back. Just pull up the edge a bit, paint a little glue underneath the edge, put in the scarf ends and gently press the edge back down again. This is very difficult to photograph and I’m finding it tricky to describe, so I hope you understand what I mean! I used the chopstick rests again to support the scarf as the glue dried. The topper is still not finished though – I have the wheels and wheel struts to add, but I will only do this when I position the topper on the cake. Of course I had my hands full attaching the struts as I couldn’t rest the topper upside down (the scarf would break) so there are no photos of the next few steps. Paint a small bit of glue into the pre-made hole for the struts. 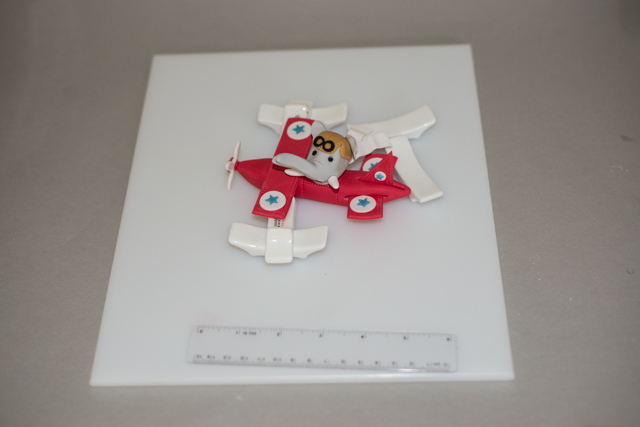 As you did with the propeller, cut two small circles of red paste. 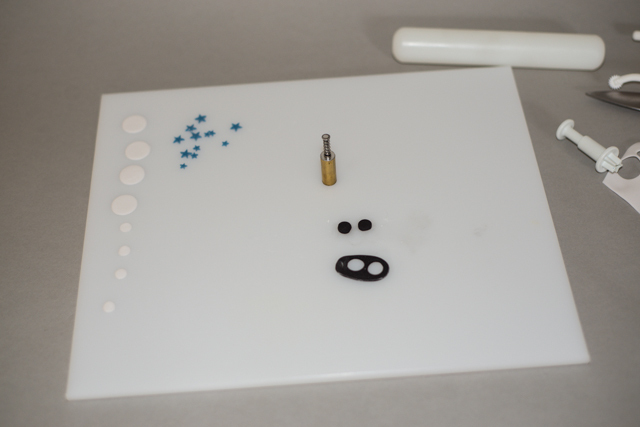 Attach the small circles to cover each pre-made hole. Put a small dot of glue on each circle. VERY CAREFULLY push the short bare end of spaghetti through the centre of the circle so it goes into the pre-made hole. Squeeze lightly to attach. Repeat for the other side. You can now use the long ends of the spaghetti to anchor the plane into the cake. 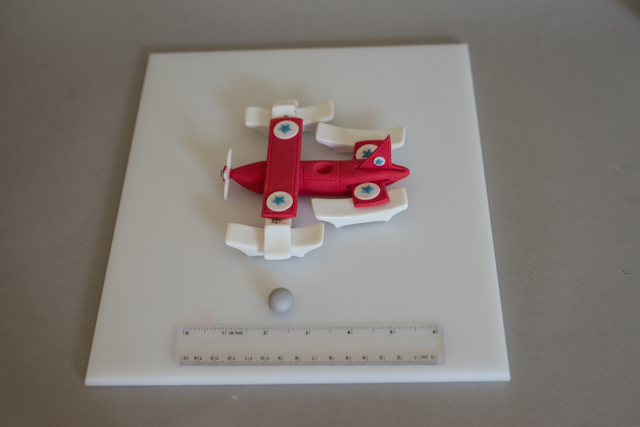 I have made up some little clouds (there are plenty of cloud tutorials available online) and have rested the plane on these at an angle. Also, my cake is a dummy, so the spaghetti would snap if I tried to insert it into a hard surface. Cake is soft, so it’s fine but you need to be firm but incredibly gentle.